File, Document and Screen Sharing and Document Highlighting, without any Download! 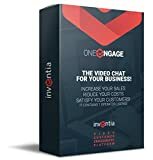 Inventia ONE NGAGE is the Video Chat for Business to communicate and collaborate with your customers. Allows to one-to-one or one-to-many Video Chat. To invite new users you need to share a link with everyone you want via email or sms, without any software installation! Inventia ONE NGAGE is the solution to increase sales on your website, with our Web Widget Module. Inventia ONE NGAGE allows to share documents and images, increase your sales, support your customers also via mobile. Reshape your business and save your costs. Communicate with your customers sharing a link. Have video conferences up to 10 people. Share documents and images and take notes in the same document. Take the control of your customer’s camera like a scanner to take pictures. Navigate with your interlocutors websites or applications. Features included: Web Widget Module to remote assist and remote support customers from your website – Call back form module in case of absence – Privacy mode that allows customer not to be seen – Document sharing module – Document highlighting module to underline parts of documents and take notes – Screen sharing module – File sharing module – Remote camera control module – Connection control system – It Works on Mobile Devices WebRTC Ready. Optional installation and support services.